The 76ers have traded center Spencer Hawes to Cleveland, according to multiple reports. Yahoo! Sports' Adrian Wojnarowski was first to report the trade Thursday morning, the day of the NBA trade deadline. Wojnarowski reported that the Sixers will receive two 2014 second-round picks, forward Earl Clark and center Henry Sims from the Cavaliers in return for Hawes. Clark has a $4.25 million team option for next season, and Sims has nothing beyond this season, so the Sixers could financially cut ties with both at the end of this season. Later in the day, the Sixers got two second-round picks (for an undisclosed draft year) and guard Eric Maynor from Washington in a three-team deal, that also included Denver, in which the Sixers gave up nothing significant. (It'll probably amount to cash.) Maynor has a $2.1 million player option for next season. Hawes, traded to the Sixers from Sacramento in June 2010, spent nearly four seasons with the team. His two-year deal was set to expire at the end of the season. 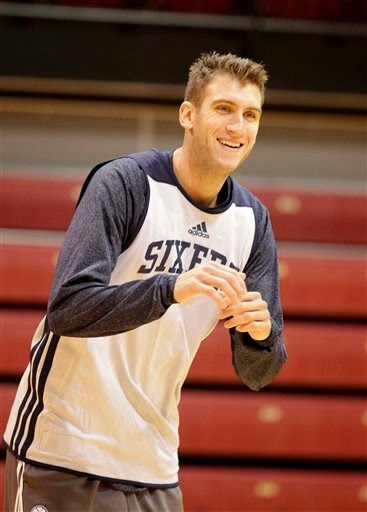 The Sixers' initial interest in moving Hawes was to attain a first-round pick in return. As the trade deadline neared, it can only be assumed that Sixers general manager Sam Hinkie lowered his asking price to help facilitate a move.